We can provide everything needed to complete this course: Our core package includes: Certified instructors and range officers, Ohio Concealed Handgun License application form, Ohio Concealed Carry Law Booklet, United States Concealed Carry Association book "Concealed Carry & Home Defense Fundamentals", targets, eye and ear protection, range time and even note taking materials. You must bring your own lunch. We have refrigeration on site. Due to time constraints everyone will be required to stay on property during lunch. If you need a firearm just let us know when you register and we can provide one at no cost. We do however require that you purchase low cost .22 LR ammunition for our firearms from us. If you own your own firearm we strongly encourage you take this opportunity to train with what you own. If you wish to use your own firearm bring 150 rounds of ammunition. We only provide ammunition for our firearms. 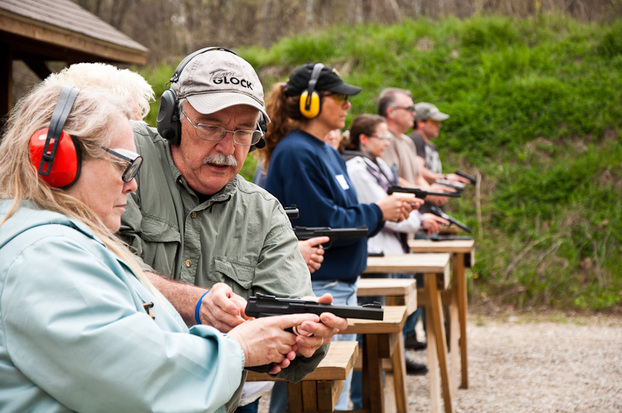 Discounts for Couples & Members of Richwood Gun & Game Club: Members of Richwood Gun & Game Club receive discounts on class fees for our Ohio CHL program. Our couples program is designed to encourage more couples to train together and for more women to take more responsibility for their own safety. This class will provide you with the basis for building a solid foundation of fundamental concepts and essential techniques necessary to begin developing a substantial defensive mindset and efficient gun handling skills. This course will focus on the defensive uses of the handgun as well as competitive and recreational use of this firearm. The ability to name, explain, and demonstrate the rules for safe handling of a handgun and proper storage practices for handguns and ammunition. The ability to demonstrate and explain how to handle ammunition in a safe manner. The ability to demonstrate the knowledge, skills and attitude necessary to shoot a handgun in a safe manner. Gun handling training to include range time and live-fire experience. Concealed Carry Issues as they relate to Ohio Law. Review of Ohio's Concealed Carry Publication. Firearm selection, holster options and concealment methods. Must pass a written exam demonstrating handgun competency usage and rules. Pass a live fire exam that tests his or her competency regarding handgun usage and the rules for safe handling, storage of a handgun and a physical demonstration of the attitude necessary to shoot a handgun in a safe manner. Please select the date and the option that best describes your situation from the drop down menus found below (Single Person or Couple - Member RGGC or Non Member or Deposit). You can pay with any major credit card or use PayPal. Your PayPal receipt will be from "Personal Defense Systems". If placing a deposit remember we need a desposit for each person attending. Don't forget to fill out one of our required REGISTRATION FORMS before leaving our site. We need your payment and registration form in order to process your request to attend one of our classes! Please review our refund policies on our registration page! Ohio Shooting Sports students on the firing line. Each student receives personal instruction during range exercises.